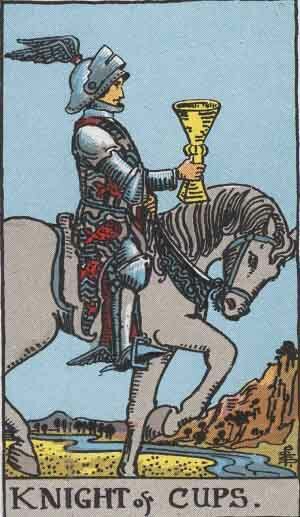 Today’s card is the Knight of Cups. A knight with a winged helmet rides a grey horse, carrying a large golden goblet before him. He rides slowly and steadily, in no haste, bringing good tidings with him. He is not a rider of war, but for peace. 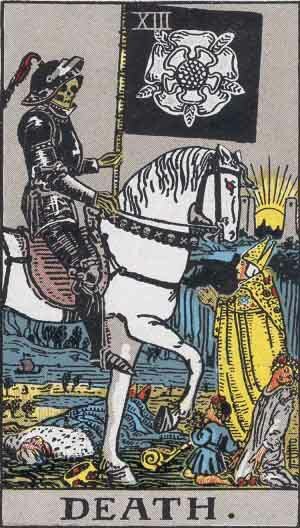 The Knight of Cups is the kind of person who always wants to look on the bright side of things. Even in the darkest, deepest pits, this person keeps a smile upon his face and a song in his heart. Though his optimism can be welcome most of the time, it can become overbearing when in a genuinely dour situation – and heavens forbid you be around him when it finally runs out. 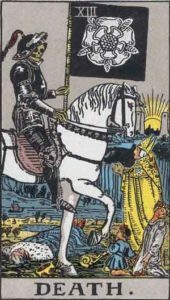 Behind the cheery exterior lies a bubbling swamp of emotional turmoil the Knight of Cups can’t seem to work out on his own. 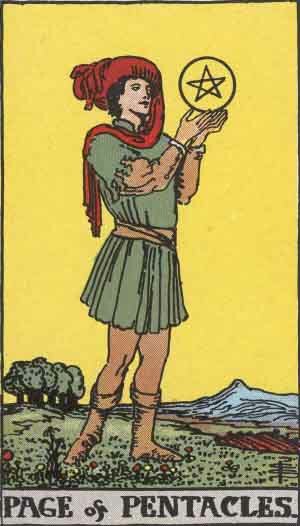 Today’s card is the Three of Cups. Three celebrants make a toast to each other in a garden. They raise their cups high and wear garlands upon their heads. Their faces are aglow with joy. 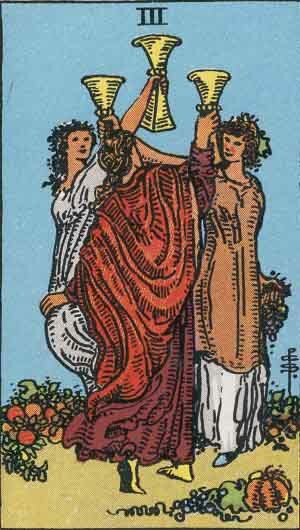 The Three of Cups is a card of friendship, togetherness, and glee. There’s nothing better than being in the company of your best friends; their energy nourishes you, and gives you a kind of happiness that no other person can match. The Three of Cups represents the bond of friendship between a group of people that is greater than the sum of its parts. It reminds us to keep the pacts between friends strong, and always be faithful to those who are faithful to us! 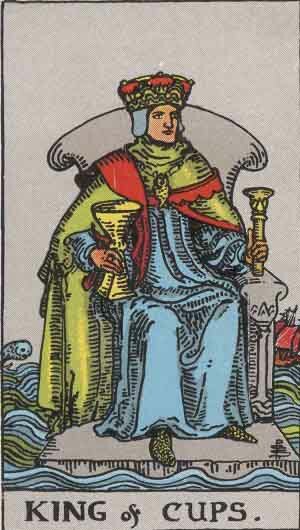 Today’s card is the King of Cups. 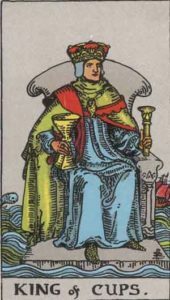 The King of Cups floats on a throne in the middle of the ocean, with ships sailing behind him. 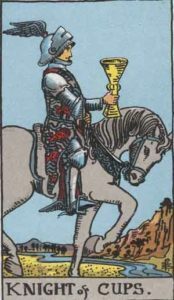 He holds his cup in his right hand, and a scepter in the other. He wears an ornate crown on his head, and a shark’s tooth necklace. 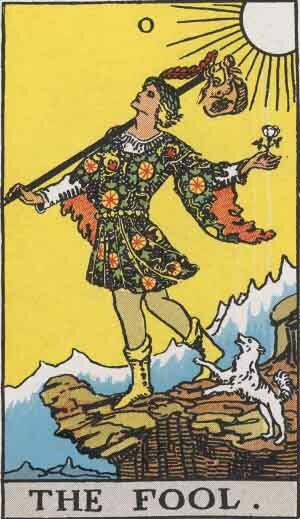 A King of Cups is the kind of person you turn to when you’re at your lowest. He always has a kind word, an encouraging statement, and the right attitude to get you on your feet. 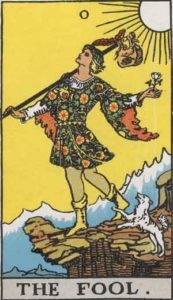 Unflappable even in the most dire situations, the King of Cups is a rock that everybody wants to anchor themselves to when the storms come to their lives. Unfortunately for the King, he tends to make it his mission to shore as many wayward friends as possible, stretching him to his thinnest limits. A judge sits upon their station, holding a sword and scales – the symbols of the ancient goddess Justitia. 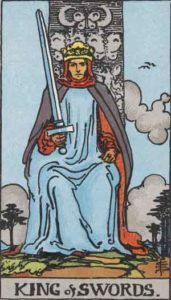 The sword represents the reach of the law, and its ability to punish wrongdoers, while the scales represent fairness and equality. 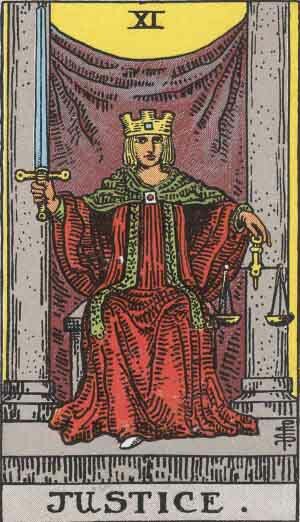 Justice is blind, or so the saying goes – and the card Justice lives up to that as well as it can. Justice is concerned with equality, fairness, and making sure that those who take advantage of others are put back in their place. On the other hand, Justice concerns itself with responsibility, making important decisions, and “doing the right thing”. 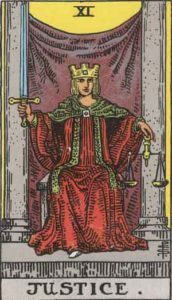 When Justice comes up in a drawing, it is a sign that you must be forthright in all of your dealings, fair to others, and ready to make the hard choices in life. Today’s card is the Ten of Wands. 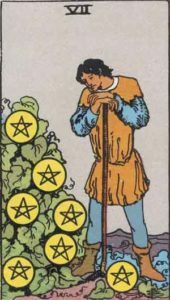 A person carries ten wands, a burden clearly too heavy for them to bear. A town is nearby, presumably their goal; will they even make it in time before their encumbrance overwhelms them? 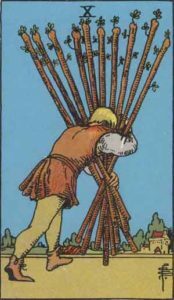 The Ten of Wands is another clear-cut card, representing overwhelming burden and struggle. The subject of the card is labored in the extreme, bend nearly in double by the weight of their wands. It appears, from the angle of their walk, that they are even coming close to tumbling over. When you see the Ten of Wands, it is a sign that you are putting too much pressure on yourself. Whether the responsibilities be reasonable or not, you must look to lighten the load, for your own sake.